efforts of the President General of Maritime Workers Union of Nigeria (MWUN), Comrade Tony Nted and the President of Dockworkers branch of MWUN, Comrade Adewale Adeyanju, the condition of service for dockworkers in all the seaports in the federation has taken effect. The Chairman of MWUN, Dock Branch, Port Harcourt District, Comrade Tony Wilson Nwokocha, dropped the hint in an interview with our correspondent in his office in Port Harcourt. Nwokocha said with the approval and effective implementation of the condition of service for Dockworkers in all the seaports in Nigeria, there would be better working environment, welfare packages and improved service delivery. 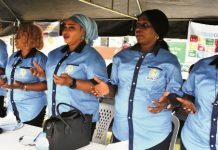 The union boss hinted that although the condition of service is subject to review after two years, it would rekindle the hopes of the workers, adding that a committee had already been set-up to review the condition of service which was reviewed last in 2014. He opined that with this development, workers salary would increase as at when due, while staff who lost his lives would be assisted during the burial, adding that, that is a good development. According to him, the management of the Port Terminal Operators has shown great concern for the welfare of their workforce, and commended all those that have made the exercise possible. Nwokocha thanked all other stakeholders, the Nigeria Maritime Administration and Safety Agency (NIMASA) and Seaports Operators Union who had played vital part during the negotiation , and appealed to them to keep up the spirit in subsequent affairs so as to give the workers a sense of belonging and beneficial.